The bay of Green Bay is an arm of Lake Michigan and is located along the southern coast of the Upper Peninsula of Michigan and the east coast of Wisconsin. And, at the southern end is the city of Green Bay, WI. The bay of Green Bay is about 120 miles long and about 15 miles wide. And, in the depths of all that water, is a lot of fish. 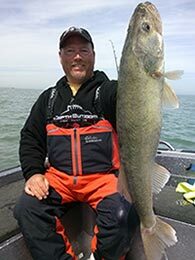 What you may not know is that the bay of Green Bay is home to great charter fishing. There is lots of action, and while boating the waters of the bay on our charter fishing trip you can find walleye, salmon, perch, musky, northern pike and trout. 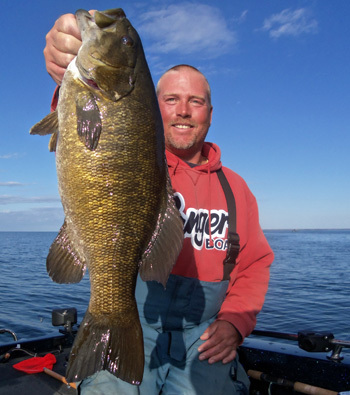 Check out our fishing seasonal guide for the best months to charter fish in Green Bay. 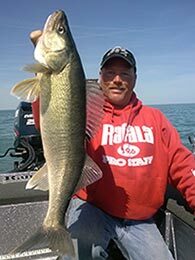 During certain months, fishing with Late Eyes Sport Fishing on the bay of Green Bay you’ll even find trophy walleye! With our expert guide, Paul Delaney, there’s no doubt that this won’t be a fun filled adventure. Don’t forget to read our section on what to bring for your charter fishing adventure. Our fishing guides want you to have the best experience charter fishing with us, so make sure to pack and bring all the necessities! 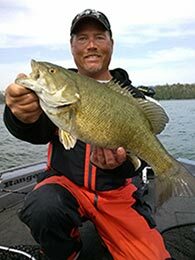 Green Bay fishing is so much more than just sport fishing. Thanks to Paul Delaney, it’s a full guide fishing service that will be an experience to remember. Whether you’re ice fishing with us in March or fishing with us in August, Late Eyes Sport Fishing and our full guide fishing service is the way to go. 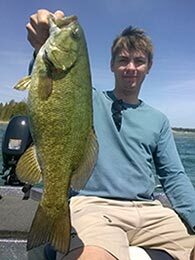 We welcome all types of fisherman to fish with us on the bay of Green Bay, from the novice to the most experienced. Capture the memory of your grandson catching his first walleye fish or salmon fish. Get the opportunity to catch one of the largest northern or brown trout in the bay. Call or email Late Eyes Sport Fishing to schedule your ice or open water fishing excursion.